Community Blog Topic: Would you play on an expansion specific server? Would you play on an expansion locked server? If so, which expansion would you pick? How would you answer the class and grouping questions above? What other logistical problems would you expect to have to be overcome? via Community Blog Topic: Would you play on an expansion specific server?, Robin Torres, WoW Insider, 9/8/13. Nope! It sounds interesting, and I completely understand the fascination with the idea, but players idealize previous expansions. How would expansion-locked servers work exactly? Would they really be exactly like they were during that expansion? Let’s not even get into specifics on exact tuning. I’ll assume experience curve, required level to use a mount, the lack of a LFR/LFD, and similar aspects of the game on a vanilla-locked server would be like they were during the end of vanilla. We’d have the old talent system – the really old one. Classes would play like they did in vanilla, and you couldn’t be Blood Elf, dranei, worgen, goblin, pandaren, death knight, or monk. It sounds fascinating to get to experience that game. The problem is, that’s a different game. Maybe it’d be easy for Blizzard. They must have backup copies of their old software, right? I don’t know, but let’s continue. What would it be like for a player? I’d find it incredibly frustrating. It’s not that I’m a worse player. It’s simply that vanilla was, honestly, worse in a lot of ways. We can argue lore, flavor, and raids, but mechanically it was a bit archaic. World of Warcraft was still one of the early MMOs even if it was definitely not the first. The genre has come a long way. Also, don’t forget how confusing it would be to play a game that looked the same but felt different. If you played the same class on both a vanilla-locked server and the current server, it would be pretty confusing. Blizzard would be in a lose-lose situation. Raid tiers are more like PVP seasons (or seasons in sports for that matter) than we think. Yes, you can go back and run an old raid, but it’s different. You can never truly go back. The majesty of an MMO is that the world, the game, the players change. Past expansions are in the past, and I want to move forward. Edit: Here’s the results post on WoW Insider: Community Blog Topic Results: Expansion specific servers, Robin Torres, WoW Insider, 9/13/13. Community Blog Topic: Which race would you like to become playable? Which race would you like to play in a future expansion? Would they be Alliance or Horde and why? What would be their racials? Do you have any ideas for their jokes and/or flirts? Blog about your answer and link to the post in the comments. Or if you don’t have a World of Warcraft related blog, leave your response in the comments below. via Community Blog Topic: Which race would you like to become playable?, Robin Torres, WoW Insider, 8/30/13. Call me crazy, but I love this warm weather! I always felt like an outcast back in Borean but I think this new climate is going to work out great for me! Well, times were getting tough up north. While the scourge problem has been dealt with, we are constantly on the move and looking for food. I decided it was time to head out and find some new fishing grounds! After almost a month at sea, I ended up here. Good thing I packed a few crates of pickled herring for the trip! If there are other Tuskarr who feel like outcasts, and times are tough for them too, might it be time for them to go adventuring? I realize we haven’t seen the Tuskarr have any affinity for magic, but there’s no reason they couldn’t discover some. They’d need seven classes to put them on par with gnomes. I’d give them hunter, rogue, and warrior easily. I think I’d really love to see Tuskarr shaman, so let’s give them that too. Fishing pole totems, perhaps? If they’re adventuring, it’s very easily conceivable that they’d begin to study the arcane, so I’ll add mage. Having a connection with Pandaria already, they could also learn to be monks. They’re already in Northrend, but I don’t really want to give them Death Knights. Warlocks also seem like a jump if they’re just learning the arcane. I’d love to see Tuskarr paladins, but that seems like quite the jump as well. Priest is a possibility, but I think Tuskarr druids would be really cool too! 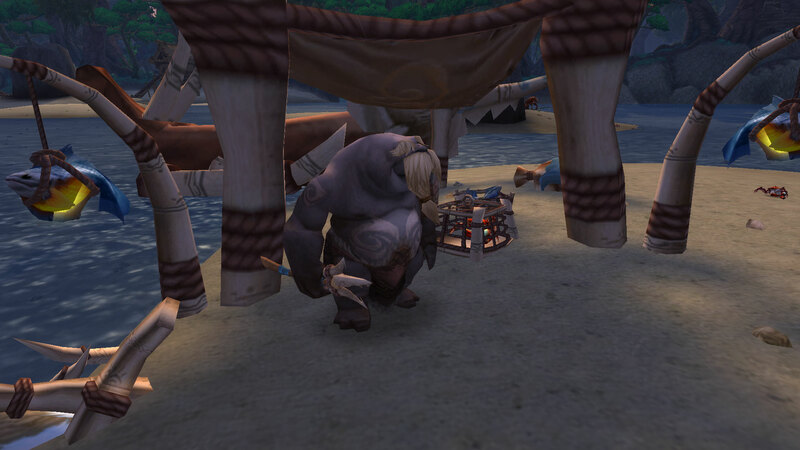 As for faction, both the Alliance and Horde have both had contact with them, and the Tuskarr haven’t shown an affinity to one over the other so far. They could be given a choice just like the Pandaren. I absolutely love the Tuskarr and would jump at the chance to play as one. However, I think it’s unlikely that they’d be added any time soon. Blizzard could always find a way to give a lore explanation, but it just doesn’t tie into the narration that we have currently (unless we’re given a curveball and are heading back to Northrend). My second choice would be the Ethereals. If and when we go back to Outland, deal with the Burning Legion, or travel to any other planet, it would be a perfect time to make them playable. I’d also allow them to join either faction and would give them mages, warlocks, priests, rogues, warriors, hunters, and monks. Edit: Here’s the follow-up piece on WoW Insider: Community Blog Topic Results: Which race would you like to become playable?, Robin Torres, WoW Insider, 9/5/13. These are totally real addons. Really. People live in Pandaria; or, our house in the middle of the sea, Michael Sacco, WoW Insider, 10/10/12. A consideration of how it doesn’t seem like people really live in Kalimdor, the Eastern Kingdoms, Outland, or Northrend, but Pandaria truly feels alive. The Warlord’s Ashes, hidden daily of the Dread Wastes, Matt Walsh, WoW Insider, 10/8/12. This is super cool. I really hope there are more like this. Mana Regen vs Throughput: Spirit Stacking in Mists of Pandaria, Derevka, Tales of a Priest, 10/9/12. Just how much should you stack and spirit, and how should you do it? Dungeons and you – a guide to basic etiquette, Matthew Rossi, WoW Insider, 10/10/12. Even if you think you know how to act in a dungeon, you might want to read this anyway. Fye of US-Quel’dorei, Transmog Fashion, 10/9/12. Bling-tastic Blingtron 4000!, Olivia Grace, WoW Insider, 10/10/12. This might be the greatest reason to become an engineer. A quick guide to archaeology on the Pandarian continent, Daniel Whitcomb, WoW Insider, 10/8/12. Planning on leveling your archaeology? Give this a read first. How to choose between the same pets, but different stats, Robin Torres, WoW Insider, 10/3/12. A look at stats on pets. Addon Spotlight: Still more pet battle addons!, Olivia Grace, WoW Insider, 10/4/12. Something tells me I’ll be looking at more pet battle addons in the future. Major reputation changes coming to WoW, Matthew Rossi, WoW Insider, 10/4/12. After one character on a Battle.net account hits revered with a faction, all characters on that account will earn double reputation with that faction all the way to exalted. Interview: Maine Senate candidate tells why gamer shaming bodes ill for the future, Lisa Poisso, WoW Insider, 10/9/12. This Senate candidate plays WoW, and it became an arguing point in her campaign. WoW Insider’s Guide to the Anglers, Matt Walsh, WoW Insider, 10/9/12. Nice little guide for people who enjoy fishing. Cosmetic Glyphs are a great idea, more please, Andrew, TyphoonAndrew’s – Eye of the Storm, 9/6/12. Andrew has some great ideas for fun cosmetic glyphs. A Thousand Posts, Rohan, Blessing of Kings, 9/4/12. Rohan celebrates his 1000th post and discusses trends in MMOs. Demystifying Spirit Shell, Derevka, Tales of a Priest, 9/3/12. If you’re playing a disc priest, you should really read this. A Crafting Mistake, Rohan, Blessing of Kings, 9/3/12. The Blue Child returns to Azeroth, Allison Robert, WoW Insider, 9/2/12. This shouldn’t be a big deal, but I’m excited anyways. Azeroth is getting its second moon back! Battleground Call to Arms not just for weekends anymore, Robin Torres, WoW Insider, 9/5/12. Huzzah! The article title says it all! Know Your Lore: Shandris Feathermoon for Warchief, Matthew Rossi, WoW Insider, 9/5/12. Rossi believes Shandris Feathermoon should beWarchief of the Alliance. Every week, Blog Azeroth proposes a Shared Topic for World of Warcraft bloggers to discuss. This week’s topic was proposed by Effraeti of Effraeti’s RP. Professions are fun for some and a necessary evil for others. Some of us have farming professions. Some of us have crafting professions. Some of us have a little bit of everything! Professions are leveled because they fit our style of play, help us in raiding, allow us to outfit our alts, and make us money. What professions do you have on your main? Do his/her professions fit their personality? Why did you choose them? If you chose professions based on your character and not on gaming needs, would that change some of their professions they use? Devee has mining and enchanting. Originally I had mining and skinning while I leveled. At the time, I didn’t feel like the gear from crafting professions actually helped much while leveling. (I have no idea if that changed.) Later, I dropped skinning to get enchanting for its utility. I think enchanting could fit in with my character. Devee is a discipline priest, and while I wouldn’t exactly say enchants protect or shield you, they are a way of helping that I could see a priest use. I’m not sure what to say about mining. What else would I choose? I think the benefit from having jewelcrafting, which is the default it seems, is pretty minor honestly. Yes, it’s a help, but I’m not going for world-firsts or anything. More importantly, Mooglegem has that profession, and we always play together. It would just be a waste. She’s a tailor too for that matter! Mining is a lot of fun though. I like going out in the world and getting little gifts. Maybe Devee would find it fun as well. What about the secondary professions? First aid is terrible, and Devee wouldn’t touch it. I only touch it for achievements. Why would I make a bandage when I could just heal? I could see Devee learning to cook some things, but it’s really not that helpful. I usually eat food when an expansion first comes out and then stop. Archaeology sounds interesting, and I think Devee would find it fascinating as well. In its current form, it’s horrible, but that’s because of the game mechanics. Devee would probably still enjoy it. Fishing is the best. It gets out to different locations, and while it can be dangerous, it can also bring you together with the opposite faction. Maybe in RP it wouldn’t be worth risking your life for a fish, but I personally loved fishing in Ironforge. Fishing was practically ruined for me when I finally caught Old Ironjaw. There was no more reason for me to fish in Ironforge. Two responses were absolutely terrific; Faye of The Dancing Tree discussed her attempt to get her husband to play even though he thought it was boring. Robin Torres of WoW Insider wrote about trying to get her daughter to play, first when she was three and then again a couple years later. Neither Faye nor Robin were successful!